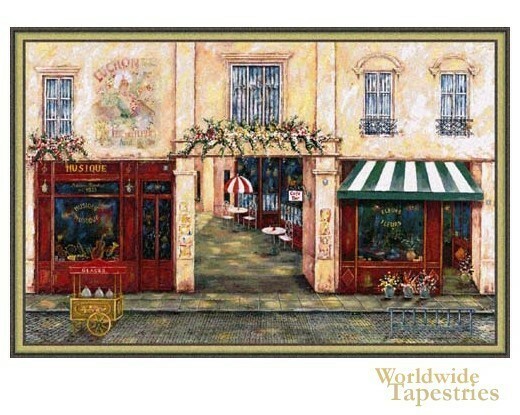 This Luchon Terrace tapestry shows a quaint village street in France. A music shop and flower shop is flanking the central entrance to the shops beyond. Such streetscapes have been the subject of art for artists enchanted by the charm of Parisian streets. The light is dappled as it hits the paved street and stone pavement of the arcade. This Luchon Terrace tapestry is backed with lining and tunnel for easy hanging. Note: tapestry accessories, where pictured, are not included in the price. Dimensions: W 70" x H 46"